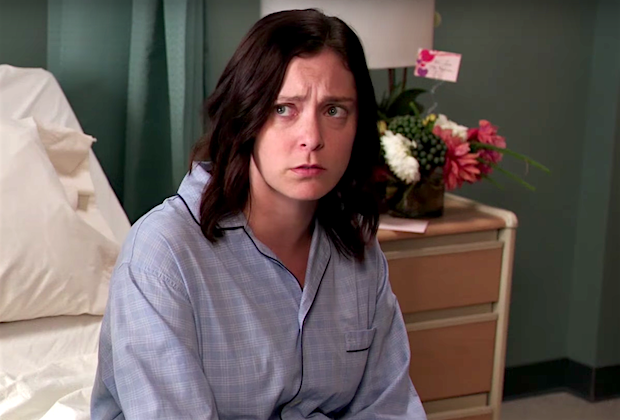 I did not like the ending of yesterday's Crazy Ex Girlfriend Season 3 Finale. My issue with this episode is that the "Rebecca pleads guilty to killing Trent" plot line didn't make much sense. It is true that Rebecca is guilty of a lot of things - the things she revealed to Nathaniel, Josh, and Paula in her "The Purge" meeting. Rebecca is NOT guilty of attempting to kill Trent. What she did was SELF-DEFENSE. When Nathaniel told Rebecca to plead not guilty due to insanity, I disagreed with him. That wasn't true either. What is true is that Rebecca was stalked by Trent, Trent told her that he was going to kill Nathaniel, and she saw Trent holding the knife up to Nathaniel. Rebecca has done some pretty irrational things in the past but, here, Rebecca's actions were completely logical. At the end of the episode. Rebecca pleads guilty in court because she wants to be held responsible for her actions. Rebecca believes she has done so many horrible things but she is never punished for what she has done. I disagree with her. Even before the murder trial, Rebecca was being held responsible for her actions. Paula telling Rebecca how hurt and angry she is and then saying they cannot be friends IS punishment for Rebecca's actions. Rebecca's actions always do have consequences. It is just that sometimes people forgive other people and Rebecca has received A LOT of forgiveness. Take Josh, for example. In that last court room scene, Josh was there to support Rebecca. Rebecca stalked and manipulated Josh multiple times. But I think Josh forgives her. What Rebecca did was ridiculously wrong, and Josh knows it was wrong, but he still keeps her in her life. When you love someone, even as a friend, you sometimes forgive them. It doesn't mean your friend HAS to forgive you. If your friend says, "I can not be your friend anymore because what you did was so wrong," you have to accept your punishment. But if they say, "You made a mistake. Thanks for apologizing. I accept your apology. I am willing to accept you back into my life as long as you do not make that mistake again," you should accept their forgiveness, work on yourself, and relieve yourself of the guilt. One thing I love about Crazy Ex Girlfriend is that it is a very complicated show. Rebecca's actions have been horrendously bad. She has STALKED, MANIPULATED, and KIDNAPPED other humans. Does she deserve forgiveness from her friends, the audience, and herself? Who decides if she deserves forgiveness? Who decides how she should be punished? One thing I know for she is, going to jail for something she didn't do is NOT the answer. Everyone has flaws, everyone makes mistakes. Friends, Family, and Lovers forgive each other all the time. When you make a mistake, own up to it, apologize to who you have harmed, figure out WHY you did it, work on yourself so you will never do it again, and forgive yourself. Rebecca needs to forgive herself. It's all about self-love!! Rebecca thinks she doesn't deserve the forgiveness her friends have given her. Rebecca has done a lot of bad things, so many people can argue that she doesn't. But I say, Rebecca, follow their example. Follow their love, and forgive yourself. Please let me know what you think by answering the poll below! Please leave a comment if you want to explain your choice! What was your take-away from the finale? Still be held responsible for her actions. Totally agree!!!!! She has a brilliant LEGAL mind or so we are to believe— why on earth would she pleaded guilty to something she didn’t do?!?! there are so many ways she could have proved her innocence.. plus according to the scene editing HER COWORKERS SAW THE KNIFE TOO!!!! WTF? I agree! Maybe because of all the things you just mentioned she will be able to get out of jail in Season 4. She HAS to be able to get out of jail or there would be no more show!